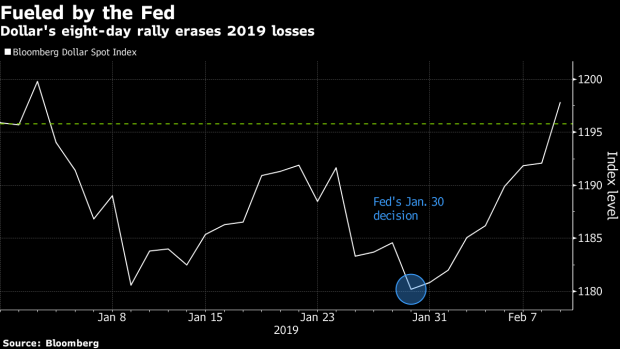 (Bloomberg) -- The dollar’s relentless eight-day rally may find another gear as central banks around the world take heed after the Federal Reserve’s dovish pivot. The greenback has gained every trading day since the Fed’s Jan. 30 decision, when Chairman Jerome Powell said the case for further rate hikes has weakened. The Fed’s shift, after it projected in December that two 2019 rate hikes were likely, inspired other global policy makers to dial back policy-tightening expectations -- including the Reserve Bank of Australia and the Bank of England. As a result, BNP Paribas Asset Management changed course on the dollar, after calling for the currency to weaken over the course of 2019. The $646 billion money manager now expects that the greenback may gain 5 percent in the first half of the year as weakening global growth prevents other central banks from hiking. While the Fed’s about-face would typically vindicate those calls, the darkening outlook for the dollar’s peers should support it in the days ahead, according to Kit Juckes, a Societe Generale SA global fixed-income strategist. The euro is a case in point: A lurch lower in German yields and sputtering European growth saw the common currency touch its lowest level since December on Monday.